Plant cuttings are small pieces cut from larger plants. When placed in growing medium (soil or potting mix), these pieces develop their own root systems. After the roots grow, the pieces are referred to as "rooted cuttings." Many home gardeners grow and sell rooted cuttings in order to earn income. Acquire plants that grow well in your local climate. For instance, desert plants do not do well in rainy climates such as the Pacific Northwest, and some flowering plants do not tolerate the heat of the Deep South. These plants are the "mother" plants that will supply the cuttings. Care for the "mother" plants, giving them the appropriate amount of sun, water and plant food. All-purpose plant food is appropriate for most foliage plants; flowering plants often require specialized fertilizers that support the growth and development of their blossoms. Ask a specialist at your local nursery about this if you plan to grow flowering plants. Use gardening shears to cut 3- to 6-inch pieces from the mother plant. If you don't have gardening shears, a sharp, clean razor blade suffices. Fill small disposable cups or flower pots with potting mix. Lightly sprinkle with water in order to dampen the soil. If you would like, dip each of the cut ends into rooting powder. The use of rooting powder is not necessary, but does speed up the rate of root growth. Press one cutting into each of the small containers. Place the small containers in an area where they receive the proper amount of sunlight for their species. 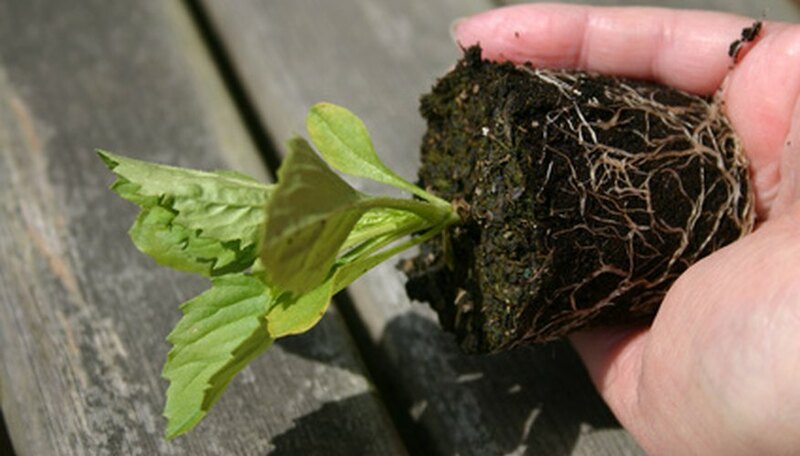 Keep the soil moist--not wet--to ensure the proper environment for root development. Feed the cuttings every two weeks with plant food diluted by half. Sell the cuttings from your own home. Place ads in local newspapers, or put up fliers on local public bulletin areas (such as at the grocery store or library). Contact local botanical societies and inquire about their plant sales. Most have plant sales at least once per year. Local growers sell their cuttings and plants at booths. Travel to fairs and festivals within driving distance. Purchase a booth space, and sell your cuttings to fair goers. Contact local nurseries and offer to sell your cuttings to them. Because nursery owners buy in bulk, your selling price to them will be significantly lower than the cuttings you sell to the public. The benefit of selling to a nursery: you get rid of most of your stock in one trip, putting money in your pocket quickly. North Carolina State University: What Should I Grow? What to Sell? Cuttings and Liner Procurement?